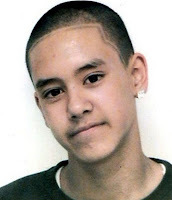 The Met has issued a press release appealing for information on the murder of 15-year-old Billy Cox at his home in Fenwick Place, near Clapham North tube station on 14 February 2007, writes Stockwell News. They hope that with the passing of time, someone will now feel able to tell police the name of the suspect for the shooting of the teenager. There were no signs of forced entry and it is possible Billy knew his attacker. His sister, then aged 12, returned to their home and as she neared the door, she heard a 'bang'. Inside, she found her brother dying. A friend turned up at the premises and helped her to give first aid whilst they waited for an ambulance. A paramedic also treated Billy but he was pronounced dead at the scene. A post-mortem gave cause of death as a gunshot wound to the chest. Detective Inspector Russell Duke said: "We retraced Billy's steps that day leading up to the shooting. We know he left Acre Lane, Brixton, SW2 at 14:36 hrs and made his way home to Fenwick Place. "Did you see him on that journey, either on a bus or underground train or even walking? Please let us know. "Were you in or around Fenwick Place that afternoon? Billy's home backs on to Cottage Grove. Did you see or hear anyone, either in front or at the rear of the property between 14.30 and 15.30? "After three years, we believe that anyone who knows who killed Billy Cox should feel that they can tell police what they know. We will treat all calls in the utmost confidence and urge you to pick up the phone, for the sake of Billy's family." Anyone who can assist should call the incident room on 020 8247 4553 or to remain anonymous call Crimestoppers on 0800 555 111. In June 2007, officers arrested five men at an address near Clapham High Street. Four were arrested on suspicion of possession of Class A drugs with intent to supply and were later released without charge. A fifth man, then aged 20, was arrested on suspicion of the murder of Billy Cox. He was also released without charge in 2008.